Our great friends over at Sparkling ICE sent over this delicious looking Pomegranate Fizz Cocktail recipe and I love consuming anything with Pomegranate flavors in it during this time of the year. Not only that...what's not to love about a pink colored cocktail, right? 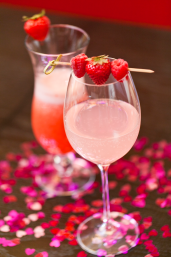 Plus...I love simple to prepare cocktail recipes and this one is definitely that! Directions: Combine all ingredients in a shaker with ice. Shake and strain into a chilled glass. Garnish with sliced strawberries. Disclosure: The recipe & photo is compliments of Sparkling ICE. You must be 21 years of age or older to consume alcohol. Please drink responsibly.